Her vehicle of choice was a Chrysler minivan because of how easily she could get in and out of one. But she wasn't a car enthusiast--you see--she was a Samir enthusiast. She was my mom. While she never understood my love for cars or photography or really what I did, she did always appreciated my talent and it gave her joy to see the fruits of it. Like how she never understood my love for improving my driving skills or my love of high speeds, but she did appreciate the fact that these skills have made me the safest driver in our family and knew that when I was behind the wheel she would arrive at her destination safely and with good time. My mother was born in Narsanda, Gujarat India in 1948 and immigrated to the US in 1972 as the wife of my father, who at the time was a mechanical engineer at American Motors in Kenoha, Wisconsin. She had a Bachelor's of Science in Botany, and although she never worked in that field, she retained that knowledge well into her 60s. While only 5 feet in height, she was my father's faithful 'right-hand man' that stood beside him in their journey of life together, helping build our home life and also participating heavily in my father's business ventures as they grew and expanded. She spent a majority of her working life as General Manager of the Days Inn in Athens, AL which we constructed in 1988 and sold in 2015. It was just a few months before we sold this business that the first symptom of ALS (amyotrophic lateral sclerosis aka Lou Gehrig's disease) showed itself. There is no history of this disease in either side of my family, so this took us off-guard. And strangely enough, there is a much higher concentration of this rare disease in the Huntsville area, particular on County Line road (as per the Huntsville chapter of the ALS Association). I can't prove it, but I have a strong hunch that either chemical or other environmental contamination was at the root of this condition for my mom, and probably is at the root cause for other local sufferers of this condition. Perhaps someone reading this will be able to make use of this information in the future. The typical life span for someone diagnosed with ALS is about 2-3 years, and my mother had just celebrated her 71st birthday--just shy of the 3 year mark. The one blessing of this disease is that when you go, you go in a very peaceful manner. She went to sleep Friday March 15, 2019 as normal, and Saturday morning was not responsive and had a diminished pulse when my father tried to wake her. Her pulse then slowly faded away over the next few hours. She needed no medications to manage pain and was still fully 'there' with all her mind until the end. Her body simply gave out. She was with my father and surrounded by extended family who were coming to visit her on Saturday. My younger brother and I were not able to be present at the time of her passing. My mother was on a newly approved medication for ALS called Radicava. It is an introvenously administered drug delivered in a similar manner as certain cancer treatments. Generally, it is for patients far earlier in the stages of this disease, and is usually not given to someone in my mother's condition. And in our experience, we saw great improvements in her energy levels from the medication. She was taking this medication literally until the last day of her life, even when doctors said it really shouldn't be helping. I think the medication probably prolonged her life by at least a few months. Other patients may not see the same results, but some food for thought for anyone out there on the fence about trying Radicava. 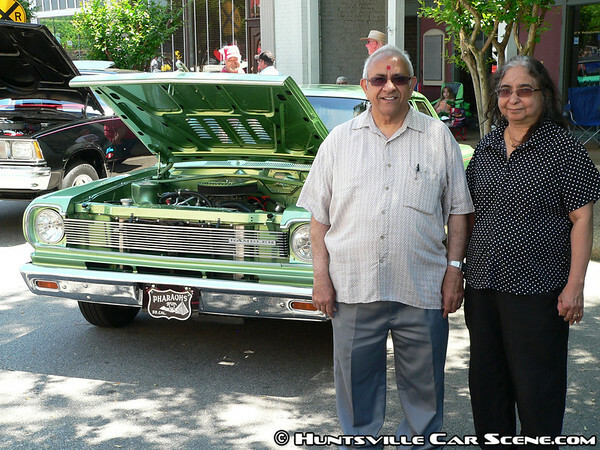 My parents never really had time to see my work or participate in it, but there was this one occasion where my wife was able to convince them to come to the 5th Annual Cars on the Square car show in 2012 for a few minutes (event coverage not yet posted on hcs). My father found an AMC Rambler which was the first model of car he ever owned, and they posed for the only photo of my parents at an event. My mom really didn't like the heat and humidity as it was a hot one, so she did her best to smile a bit before needing to retreat to an air conditioned place. My mother's illness is just one of the things that pulled me away from the local scene that I love so much, and if you can imagine multiple things on this level of 'life altering' then that's where my years have gone while I've been away from the scene. I invite all of you to the visitation and services today (3-19-2019) at 12:30pm at BerryHill Funeral Home, 2305 North Memorial Parkway, Huntsville, AL 35810. I will be present as well as my brother and father. And if you bring a cool ride, it would lift our spirits in ways you can hardly imagine. Thank you for the support and love over the years--it has meant more to me than you can possibly imagine. RIP my little Mommy. You will be missed. I am so sorry for your loss. The passing of a parent is never easy. My father passed away when he was just 44. I was only 20 and I miss him every day. I still have his 1965 Olds 442 which I got back on the road in 2016. I clearly remember go about 135 miles an hour at about 2 am somewhere between Hampton, VA and Gastonia, NC in December of 1965. He and I were going to visit relatives and take Christmas presents. The car was 5 months old. He said, "Let's see what it will do". He put his foot down and ran out of speedometer. I estimated our speed based on the tachometer. When he slowed down, we still had more tachometer to go. So, 135 was not the limit. But it was very fast. I wish I could have been at the service for your mom. However, I was just discharged from UAB hospital. I'm a 1951 baby. So, I'm right there in the generation of your parents. I hope to see you soon so that I can offer my condolences in person. Thank you so much for the condolences and thoughtful words as well as the great story about your dad. It means a lot to me to read these, especially at a time like this when the loss is ever present. All good on not being able to attend as the short notice for these types of things makes it difficult--more than half of my extended family couldn't even make it even though they wished they could. Take care of yourself and we'll hopefully see you again very soon.